Incomplete signup add-on lets the dating site owner keep track of the site visitors who tried to register on their site and for this or that reason failed to do so. 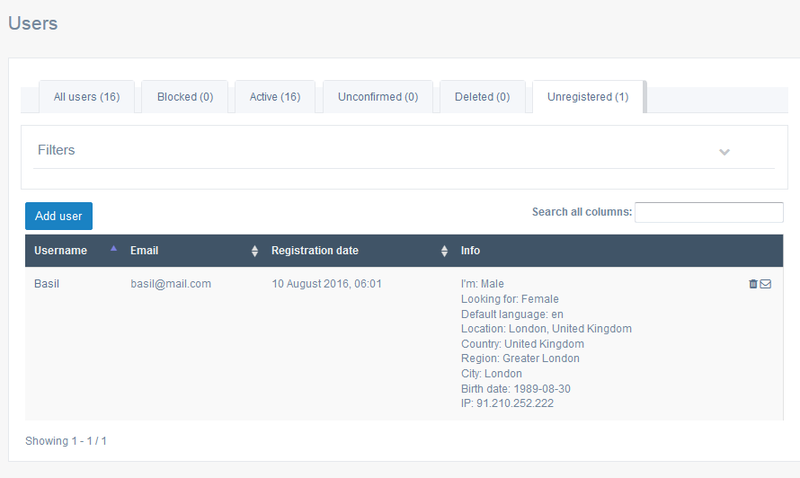 In the special section of the admin panel > Users > Unregistered (/admin/incomplete_signup/not_registered) you can view all the information that a visitor managed to submit in the sign up form, including their actual IP location, excluding the password info. Please note: The would-be site user’s details are only collected if there is an email address, because otherwise you would not be able to contact them. With the email address, you have the chance to send a message directly to this person and offer assistance with signup, and extra info about the site, or to send a bonus or some promo materials about the site. In section Modules > Incomplete signup (/admin/incomplete_signup/index/) you can set the time delay before the info becomes visible to you, and the frequency with which the data is collected and updated.